Toko Telo are a dazzling trio from the unique and exceptionally rich musical island of Madagascar, who will be making their way to Bury St Edmunds on 23 April. Toko Telo translates as ‘group of three’, a humbly modest description of what is in effect a Malagasy super-group. Individually, female vocalist Monika Njava – celebrated as the ‘national diva’ - and the guitarists D’Gary and Joël Rabesolo are three of the biggest stars in Madagascar. Celebrated across Madagascar, Monika Njava sang lead in the prize-winning group Njava, with two critically acclaimed albums for EMI, and also recorded vocals with the chart-topping group, Deep Forest. Singing in several Malagasy dialects, Monika draws on folktales and everyday village life for her lyrics, from the very real fear of violent cattle thieves to her shyness about wearing a skirt because of her skinny legs. One song is about drunken reveler going home, admonishing the wagon driver to hitch up the zebu correctly - he may be drunk, but he still wants to avoid an accident! She also addresses contemporary themes, such as corruption and environmental devastation. Guitarist, lyricist, composer and arranger, Joël Rabesolo grew up playing the traditional four-stringed kabosy. He plays with a deep knowledge of the island’s rich array of regional styles, which he interprets with sophistication and extraordinary imagination. Admitted into the Royal Conservatory of Brussels in 2015, he was quickly invited by the head of the jazz guitar department to form a recording and performing duo. Toko Telo’s debut album Toy Raha Toy, went to number one in the Transglobal World Music Chart in August 2017 and remained in the top 40 for five months. In December, Toy Raha Toy was placed at number 7 in the Transglobal World Music Chart’s 100 best world music releases of 2017. “With Toy Raha Toy, they've created perhaps the best introduction yet to Madagascar's utterly alluring folk music” (Banning Eyre). Honoured at home and acclaimed abroad, these heroes of Madagascan music revisit their shared roots with stunning guitar work and soulful vocals. Madagascar is an exceptionally rich musical country, and Toko Telo provide the perfect introduction to some of the best music that the island can offer. Toko Telo are at The Apex on Monday 23 April at 7.30pm. Tickets are £12.50, with £5 tickets for those aged under 25. 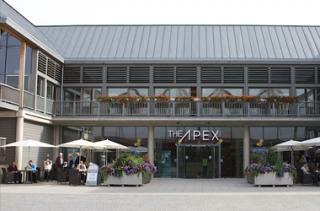 Ring the box office on 01284 758000 or see www.theapex.co.uk for details.